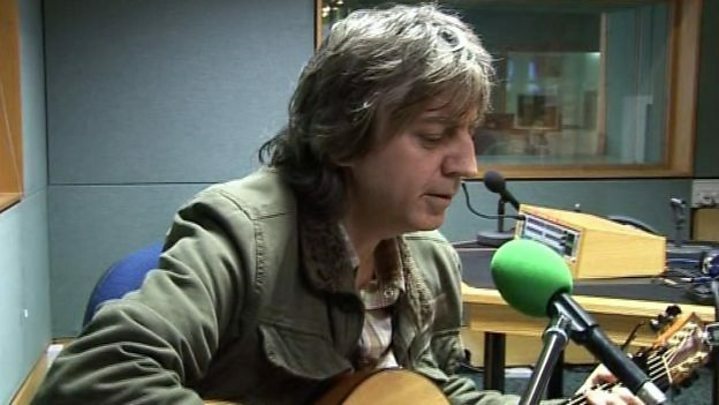 The well-known Belfast singer-songwriter Bap Kennedy has died. He was diagnosed with pancreatic cancer earlier this year and passed away on Tuesday evening. He was 54. His death was announced on a post on his Facebook page which said: "Bap was extremely brave until the end. "We would like to thank everybody for their kind messages of support over the past few months, these meant a lot to Bap and Brenda and helped Bap stay positive throughout his illness. "We are also extremely grateful to all the staff at the Marie Curie hospice for their kindness and warm heartedness during his stay." He was noted for his collaborations with Steve Earle, Van Morrison, Shane MacGowan and Mark Knopfler, as well as for writing the song "Moonlight Kiss" which featured on the soundtrack for the film Serendipity (starring John Cusack and Kate Beckinsale). 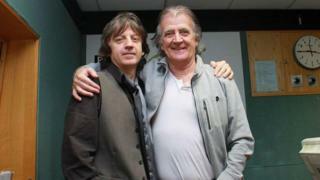 In a statement to BBC News NI, a spokesperson for Van Morrison said: "It is with deep sadness that Van has heard of the passing of Bap Kennedy. "Bap was loved by both fans and musicians in equal measure. Van's thoughts are with Brenda, and the family, at this very sad time." Mark Knopfler said he was "an extremely talented and committed songwriter who applied himself to his craft at all times". "I have nothing but happy memories of our days and nights in the studio and out on the road," said the Dire Straits frontman. Martin Christopher Kennedy was born in June 1962 and grew up during the Troubles in west Belfast. Martin's nickname stems from the Belfast bakery company, Kennedy's. They made the popular Belfast 'bap' - a small crusty loaf - and it was natural that people should nickname any Kennedy, "bap". In the late 1980s, Bap Kennedy established a formidable reputation as a singer and songwriter, fronting the band Energy Orchard. After five albums they split - but Bap's talent had not gone unnoticed. Musicians like Van Morrison, Shane MacGowan, Mark Knopfler of Dire Straits and alt-country superstar Steve Earle became regular collaborators. Earle called him the best songwriter he had ever seen. Bap was still recording and gigging when he was diagnosed with cancer in May. With his wife Brenda he wrote a regular, moving, brave blog chronicling the development of his disease. Bap Kennedy will be mourned by musicians and fans in Northern Ireland and across the globe. In May 2016, Bap broke the news of his cancer diagnosis in a blog and wrote about how touched he had been by the large number of people who had contacted him to say how much his music meant. "I didn't know how many people have been touched by my songs," he wrote. "It's breaking my heart to find out now when I have so little time to do anything about it - but I am also very happy to feel the achievement. It's what I always wanted. Not money. Not fame. "I always wanted people to feel what I feel. The magic of music." BBC Radio Ulster presenter Ralph McClean described Bap as "one of our truly great songwriters". "Bap's always been about the music and I think, more than anything, he was just an incredible musician, incredible artist," he said. "He always had the ability to write songs that would just break your heart. "He had a kind of sad, Celtic mysticism about him as well which was great. "He was also a very funny guy and a very laconic guy and a very laid back guy." Bap's younger brother is the singer Brian Kennedy. In September, while speaking about his own diagnosis with rectal cancer, the singer revealed that he had met with his brother Bap after being "estranged for a very long time". "Estrangement becomes like a very bad habit," Brian said, "It just becomes the norm. We just got used to not hearing or seeing from each other. "I got to see him again and give him a hug and if anything good has come out of this, it was the chance to see him again. "I think that cancer puts manners on the best of people, the best of situations and the worst."